The Directorate for Evaluation and Accreditation (DEVA) has launched various programmes intended to promote the evaluation of quality in university institutions. DEVA evaluates Andalusian universities and their studies, centres and programmes. Also, DEVA is currently monitoring the process for evaluation of teaching staff performance (Docentia programme) in coordination with ANECA. In addition, DEVA evaluates university applications to establish new centres for teaching studies in accordance with foreign education systems, as well as private studies. DEVA is in charge of accrediting foreign language proficiency accreditation procedures of Andalusian universities. 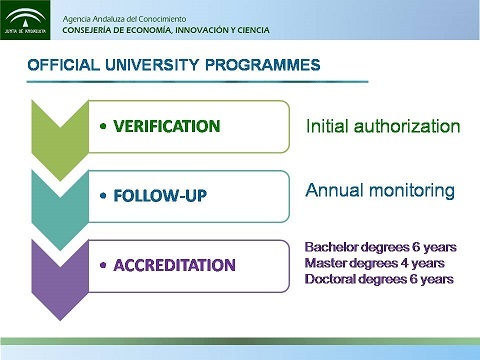 Moreover, DEVA manages a database of innovation evaluators cooperating with Andalusian universities in evaluating their annual calls for innovation projects.